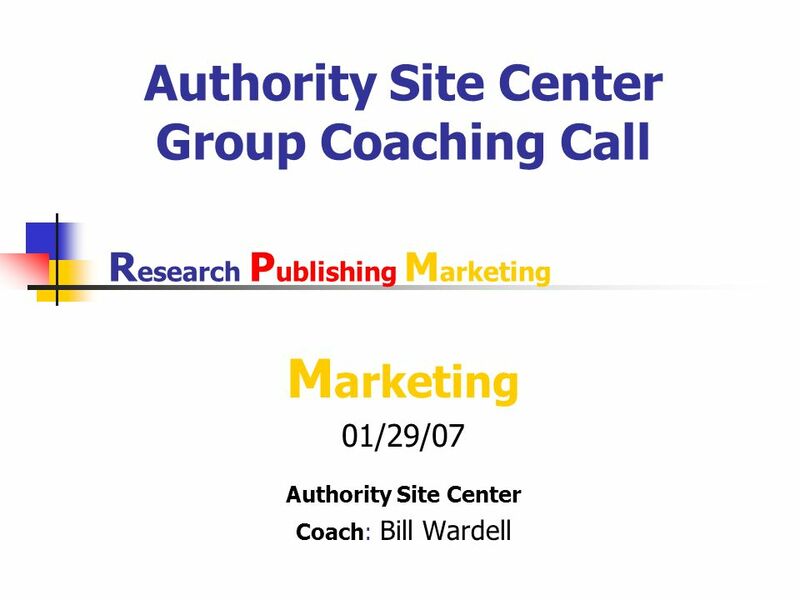 Authority Site Center Group Coaching Call M arketing 01/29/07 Authority Site Center Coach: Bill Wardell R esearch P ublishing M arketing. 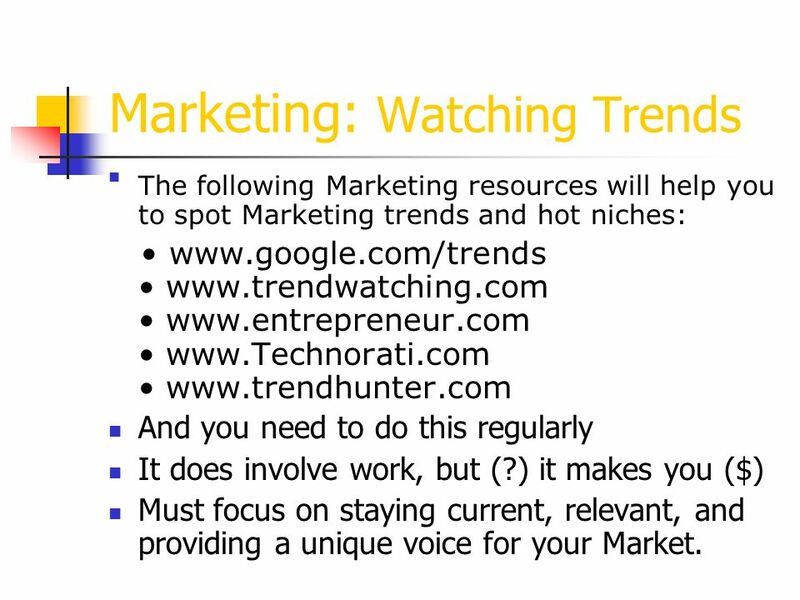 9 Marketing: Watching Trends The following Marketing resources will help you to spot Marketing trends and hot niches: www.google.com/trends www.trendwatching.com www.entrepreneur.com www.Technorati.com www.trendhunter.com And you need to do this regularly It does involve work, but (?) 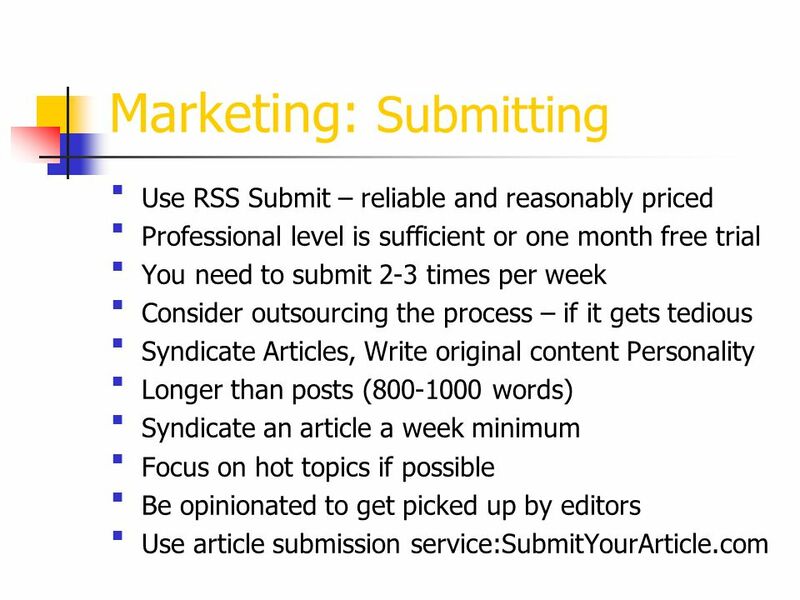 it makes you ($) Must focus on staying current, relevant, and providing a unique voice for your Market. 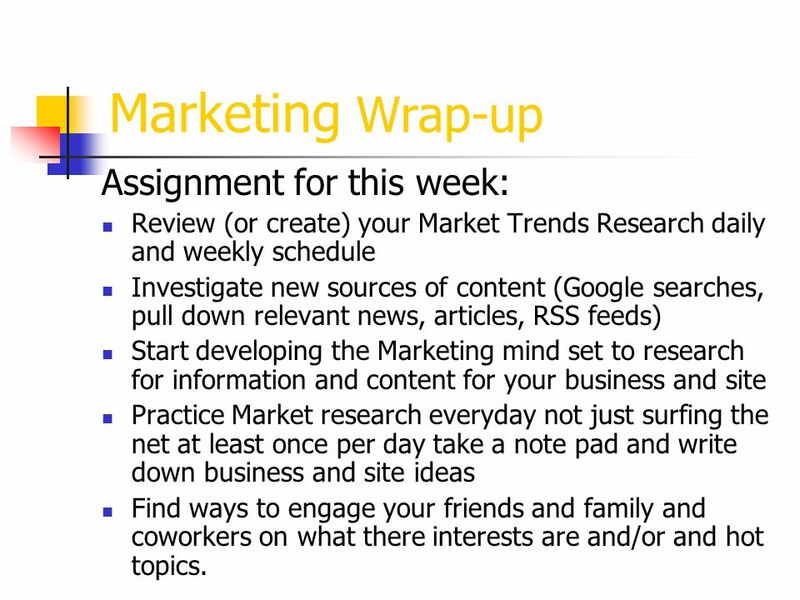 10 Marketing Wrap-up Assignment for this week: Review (or create) your Market Trends Research daily and weekly schedule Investigate new sources of content (Google searches, pull down relevant news, articles, RSS feeds) Start developing the Marketing mind set to research for information and content for your business and site Practice Market research everyday not just surfing the net at least once per day take a note pad and write down business and site ideas Find ways to engage your friends and family and coworkers on what there interests are and/or and hot topics. 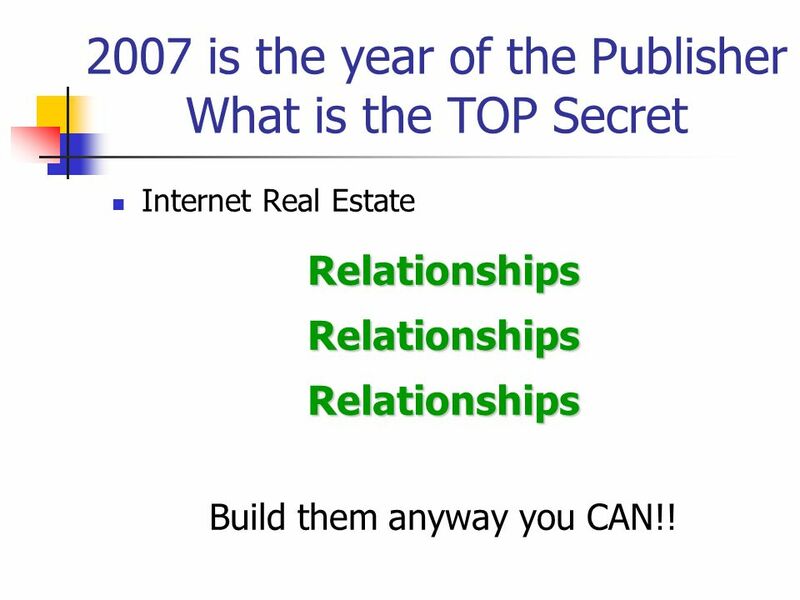 13 2007 is the year of the Publisher What is the TOP Secret Internet Real EstateRelationshipsRelationshipsRelationships Build them anyway you CAN!! 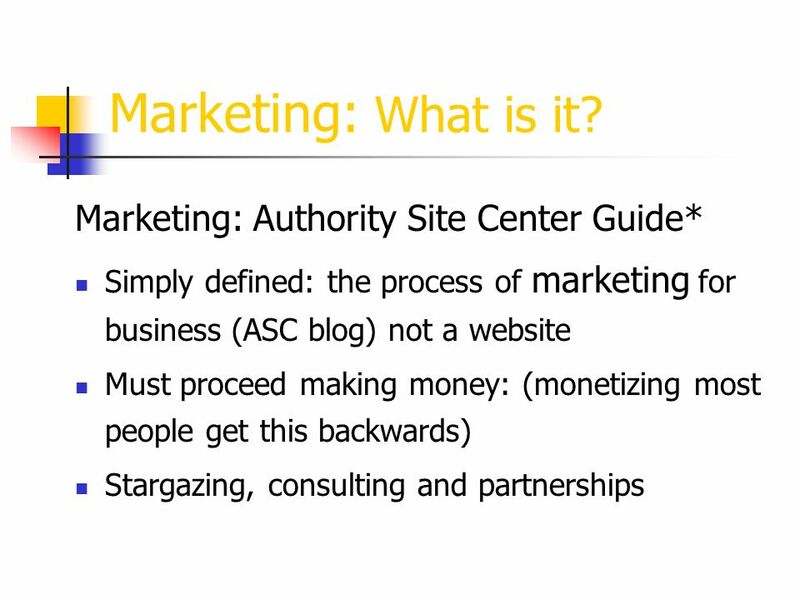 Download ppt "Authority Site Center Group Coaching Call M arketing 01/29/07 Authority Site Center Coach: Bill Wardell R esearch P ublishing M arketing." 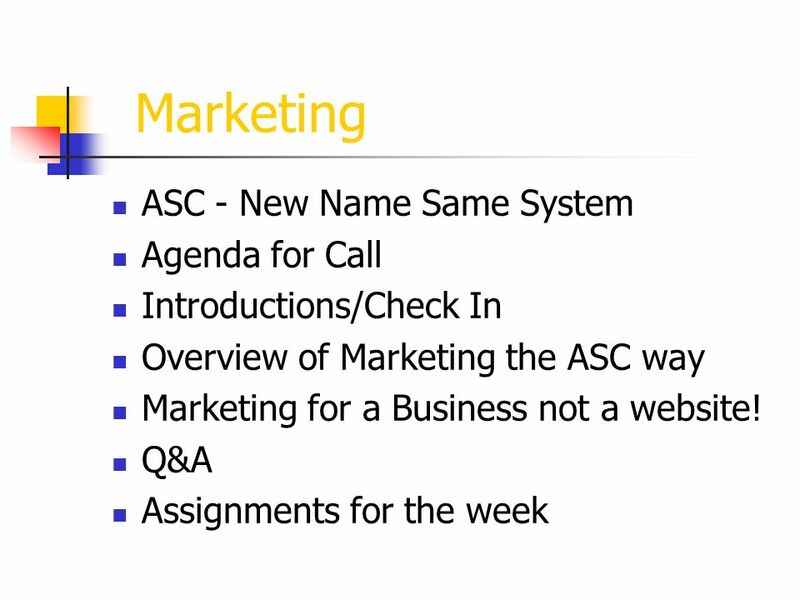 Internet Marketing Training With Your hosts Don & Janet Legere Saturdays at NOON Eastern ~ Everyone Is Welcome ~ Learn to use simple proven systems. Building Your Community and Market with Web 2.0 Applications Oct 27, 2010 David S. Eng Project Lead Web 2.0 Applications. 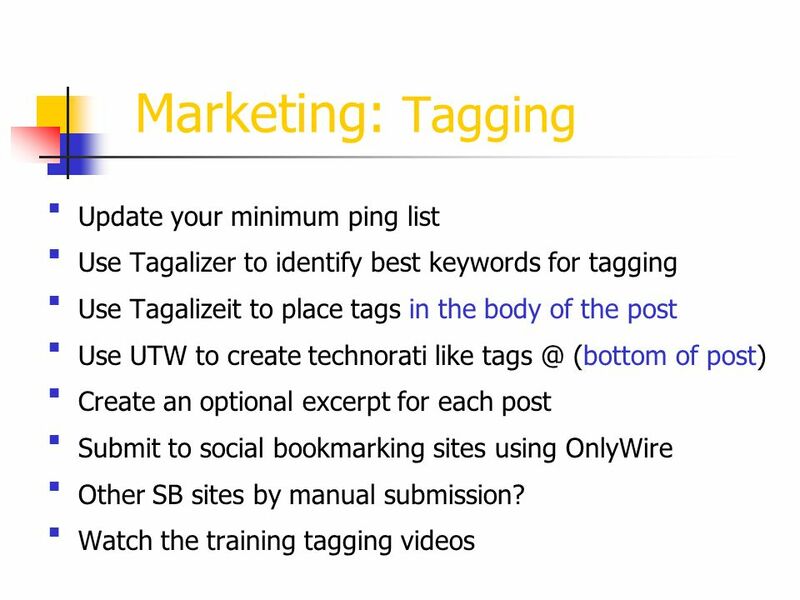 ”SEO” Search engine optimization Webmanagement training - Dar es Salaam 2008. Ravi Parikh MD/MPP Candidate. 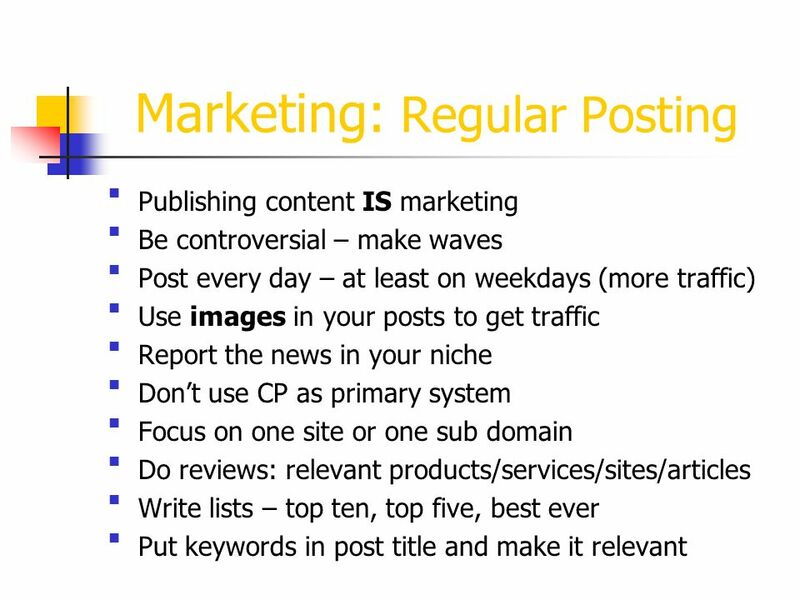 What we WILL cover What we WON’T cover  Why and why not to blog  Finding the right blog to write for  Understanding your. By: Carrie Sun, Jennifer Ouch, Yuting Hao. G oogle # 1!!!!!!!!!! 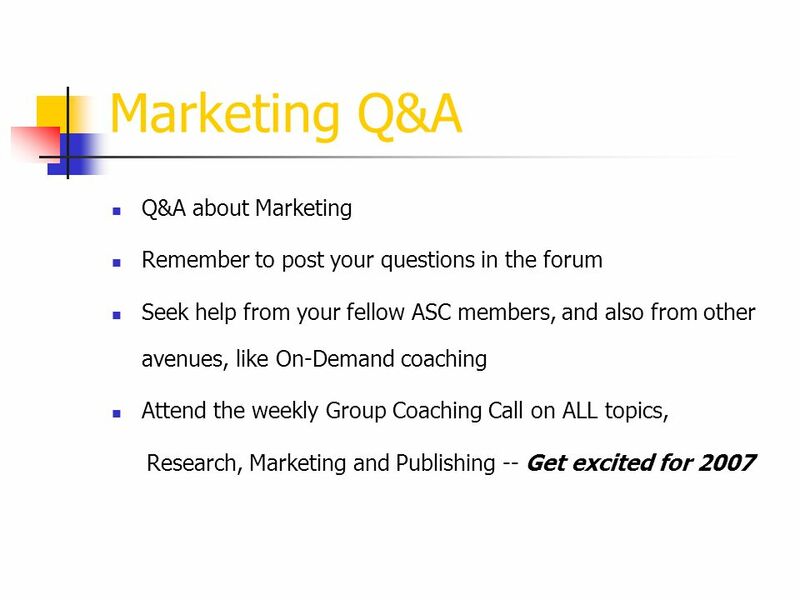 Publishing Week /02/07 ASC Coach: Bill Wardell R esearch P ublishing M arketing. Blogs 101 Reading, Writing & Finding. 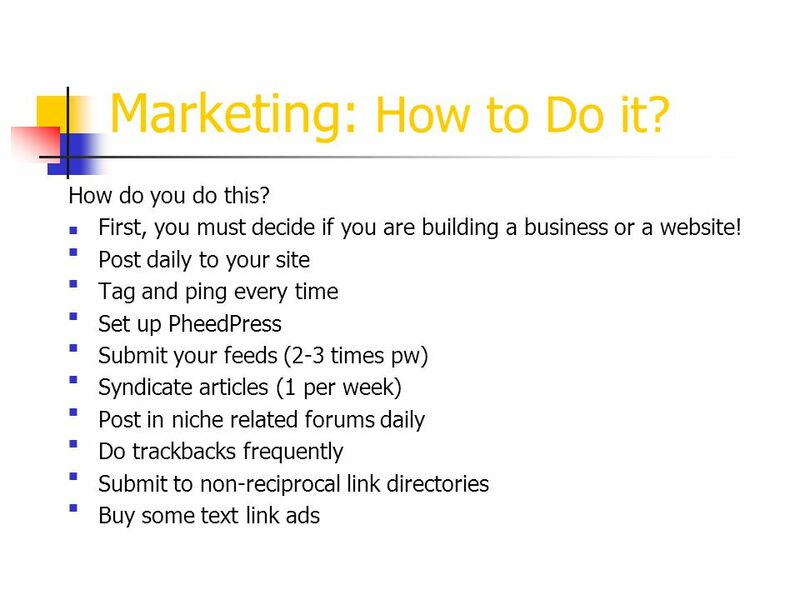 What makes a blog…a blog? 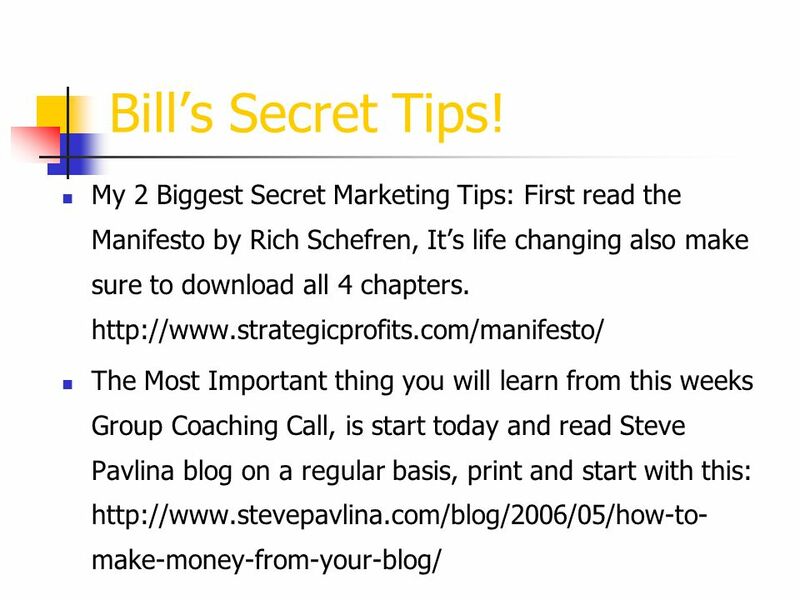 “When I meet big honchos, important people involved in the web, I ask them if they have. CSC 101 Slide Show Ashley Carroll. Podcast What is Podcasting? Podcasting is the distribution of audio or video files, such as radio programs or music. Video Optimization Optimize your channel – Channel name – Fill in your profile – Background image – Fiverr – Make a playlist – Get friends + subscribers. RSS Part One ACE 2004 June 21, What if you...? 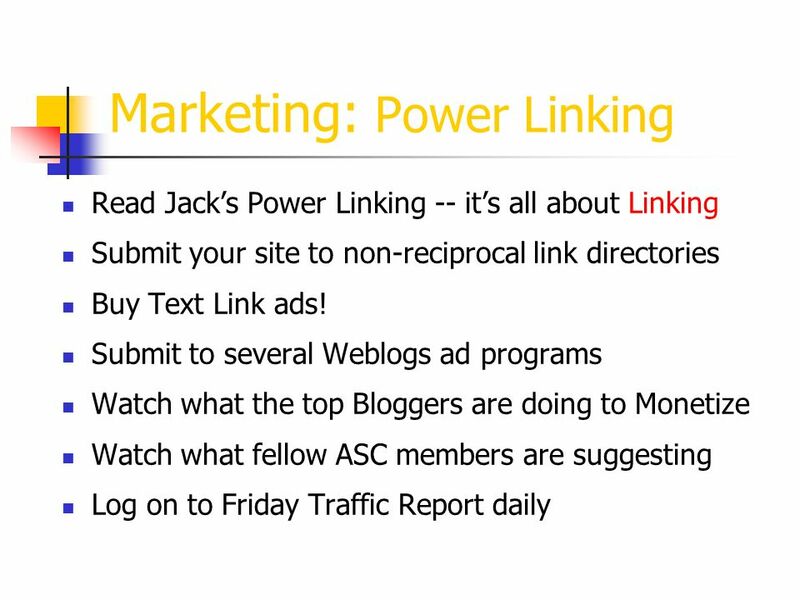 Offered direct, immediate delivery of fresh content straight to the desktop Provided automatic information.